Posted July 3, 2011, 2:21 PM. Capping the end to what has been a wet winter and spring, weather in the month of June in Southern California's inland valleys was cooler and slightly wetter than normal. The month began mild and ended warm, with a rare June shower showing up on the 6th. The beginning of the month continued a mild spring pattern that had been prevalent since April, due to more southerly than usual jet stream. The warmer temperatures at the end of the month were not enough to overcome the milder temperatures at June's beginning. For the month, average high temperatures inland were between two and four degrees cooler than normal, continuing a long trend that dates back into 2010. Predictions from NOAA's Climate Prediction Center at the beginning of the month had called for an equal chance of above or below normal temperatures. Still, the start of summer on June 20th was like a flip of a switch, with temperatures immediately getting warmer, as a mini heat wave arrived. Conditions have generally stayed warm since then, with only a couple of regressions. 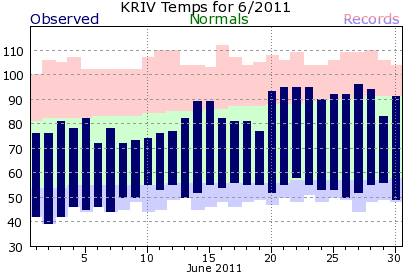 Note: normals are used for communities with five or more years of data, and do not include this past June.